A little boy from southern Maine needs our help to make this Christmas – and it could be his last Christmas – merrier and brighter. Nine year old, Jacob, is in the fight for his life, battling Stage 4 Neuroblastoma. Jacob, who is receiving care at The Barbara Bush Children’s Hospital, the Children’s Miracle Network Hospital in sourthern Maine, and his family know time isn’t on their side. That, however, isn’t stopping this family from celebrating Christmas – it will just be a little early. And, we can help brighten their holiday. 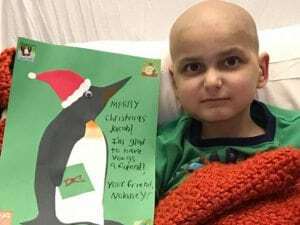 Please consider mailing Jacob a Christmas card to share in his spirit of the holidays. Cards can be mailed to Jacob Thompson, c/o Maine Medical Center, 22 Bramhall Street, Portland, ME 04102. And, on behalf of our friends at The Barbara Bush Children’s Hospital, thank you for brightening Jacob’s Christmas a little earlier this year. Next post: Can we borrow your birthday?